Phytotoxic effects of chemical pollutants are often performed using cell growth assays with unicellular green algae. In this study by the Center for Environmental Research and Sustainable Technology in Bremen, Germany, the toxicity of the antibiotic ciprofloxacin to the green algae Raphidocelis subcapitata was investigated using CASY. The determination of the EC50 proved to be very effective, due to CASY's easy of use and concurrently due to it's capabilities for the simultaneous determination of cell number, biomass, cell size and cell volume distribution of unicellular organisms. As the study points out, this comprehensive analysis allows a more refined interpretation of test results and conclusions on the compound's mode of action. 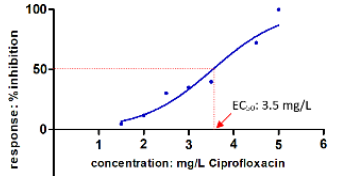 Figure: Determination of the EC50 of ciprofloxacin on R. subcapitata. CASY was used in another study, to examine Cell growth and proliferation of Raphidocelis subcapitata in more detail. Read this the Application Note ..